ISIS group has claimed it was behind a deadly shooting at an ancient citadel in Russia's volatile North Caucasus region of Dagestan, an area increasingly becoming a hotbed of extremism. 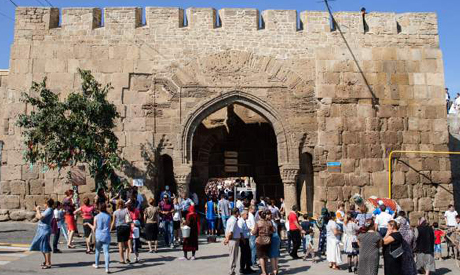 Tuesday night's attack near the historic citadel of Derbent, which left one person dead and 11 injured, is the second claimed by ISIS in the Russian Caucasus since September, according to local news portal Caucasian Knot. The Russian authorities are battling to prevent residents from joining up with the brutal jihadist group in Iraq and in Syria, where Moscow has been waging air strikes over the past two months. "With the help of Allah, the warriors of the caliphate were able to attack a group of Russian special service officers in the city of Derbent in southern Dagestan, killing one officer and injuring the others," the jihadist-monitoring SITE Intelligence Group quoted ISIS as saying on Wednesday. Islamist rebels in Dagestan, a restive region just east of Chechnya, have been increasingly flocking to join ISIS, which in June declared it had established a franchise there. Dagestan leader Ramazan Abdulatipov said last week that some 600 residents had left to join the ranks of ISIS, and that anti-terror commissions had been set up in every district in a effort to curtail the group's appeal. The region's police force had published an even higher figure earlier this month, claiming 900 Dagestan residents had joined armed groups in Syria. "The success of the Islamic state has a certain appeal for militants from the North Caucasus," political analyst Alexei Makarkin told AFP. "Many leaders of armed groups in the region have pledged allegiance to IS, hoping to receive its financial support. Ideology is not the main factor." Russia's Federal Security Service (FSB) said earlier this month that nearly 2,900 Russians are fighting or have fought with the jihadists in Iraq and Syria. The Derbent attack targeted Russian security forces, with an unnamed source telling RIA Novosti state news agency that a member of the FSB had been killed and another injured. The shooting took place as Russian warplanes wrapped up two days of intensive bombing raids over Syria, carrying out 121 sorties in which they hit 424 targets, the military announced on Wednesday. As the hunt for suspects continued, the authorities launched anti-terror operations in southern Dagestan, introducing unspecified "temporary restrictions". The gunmen, who were reportedly hiding in the forest, opened fire at a group of people near Derbent's fortress, which was declared a UNESCO World Heritage site in 2003. Sixty-seven bullet casings were recovered at the scene, a law enforcement source told Interfax news agency on Wednesday. Located on the southeastern shore of the Caspian Sea, Derbent claims to be Russia's oldest city and celebrated its 2,000th anniversary earlier this year. Analysts said that isolated incidents claimed by ISIS in the region do not constitute a broader trend, given that the group has yet to perpetrate a large-scale attack on Russian soil. "IS has yet to demonstrate significant potential for attacks in the region," said Caucasian Knot editor-in-chief Grigory Shvedov, whose site monitors militancy in the North Caucasus. "IS militants are present in the region but their involvement in acts of terror is limited." Shvedov said the group was still at a "formative stage" in the region and that its resources were "more limited than we think". Both IS and Al-Qaeda's Syrian affiliate Al-Nusra Front have called for attacks in Russia in response to Moscow's bombing campaign in Syrian. The Kremlin is fighting a deadly insurgency against Islamist rebels in the largely Muslim North Caucasus, with unrest particularly intense in Dagestan. At least 118 people were killed in Dagestan in the conflict between January and November, according to the Caucasian Knot. Moscow has said part of the reason why it launched its bombing campaign in Syria on September 30 was to prevent ISIS jihadists and other extremists from perpetrating attacks on Russian soil.